Percival Lowell was a mathematician, businessman, travel writer, and astronomer. The Lowell observatory in Arizona was the first permanent observatory built solely for its viewing conditions: high altitude to minimize atmospheric distortion, minimal cloud cover, and remote from the light pollution and smoke of cities. Lowell discovered an enormous network of canals and oases on Mars, from which he deduced the existence of an advanced Martian civilization. Later studies by astronomers with larger telescopes found no canals and no oases. The canals were an illusion – Lowell’s aspirations led him to ‘see’ a landscape his telescopes lacked the power to resolve. However, he was not the only astronomer to see canals on Mars! Early triumphs for the Lowell Observatory were the discovery of galactic redshifts, hinting at an expanding universe, and the discovery of the rotation of spiral galaxies. Lowell’s search for a ninth planet, he called it Planet X, led to the discovery of Pluto. 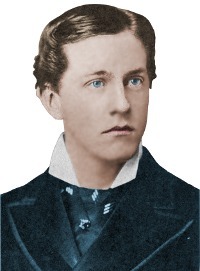 Percival Lawrence Lowell was born on March 13, 1855 in Cambridge, Massachusetts, USA into a very wealthy and influential Boston family. His father was Augustus Lowell, a powerful businessman and philanthropist, owner of a textile business empire. His mother was Katherine Bigelow Lawrence, whose affluent father had founded the city of Lawrence, Massachusetts and had been the United States Minister to Great Britain. The couple had seven children, two of whom died in infancy. Percival, known as Percy, was their eldest son. Percival’s brother, Lawrence, became president of Harvard University; and his sister Amy became a Pulitzer Prize-winning poet. Percival’s schooling began at Miss Fette’s private elementary school in Boston. In 1864, when Percy was nine, his mother became very ill. The family relocated to Europe on the advice of their doctor. Percival spent two years at Kornemann’s boarding school in Paris, where he became fluent in French. The family returned to Boston in 1866. Percival developed a great enthusiasm for astronomy, observing the night sky with his telescope, noting the white polar caps on Mars. The Lowell family was so wealthy that Percival knew he would never need to work. However, he adopted a personal philosophy and urged his brothers and sisters to follow it too: do something worthwhile, of real significance, and work hard at it. His high school was the newly opened Nobles (now the Noble and Greenough School) a prestigious all-boys private prep school in Boston. He graduated in 1872, age 17. Next came Harvard University, a family tradition: five generations of Lowells before him were educated there. He graduated with distinction in Mathematics in 1876, age 21. After he graduated, he chose to give an astronomy-flavored speech on the nebular hypothesis. Lowell spent a year traveling around Britain and the European continent. He traveled as far as Syria, before returning to Boston to work in the family business for six years as head of a large cotton mill. 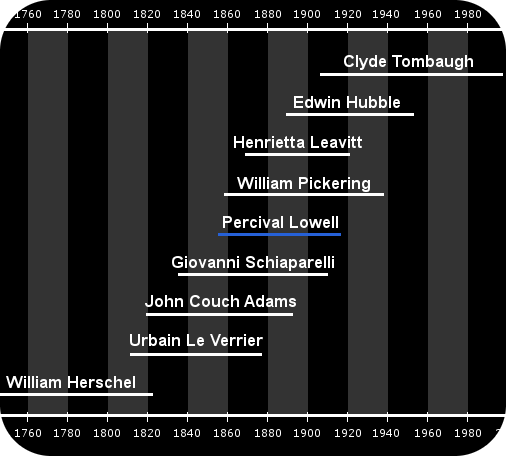 Lowell’s lifetime and the lifetimes of related scientists. On September 5, 1877, the orbits of Mars and Earth brought them to a separation of just 35 million miles, a particularly close pass. Lowell at this time was beginning his six years as a businessman. At ‘opposition’ the distance separating Earth and Mars is at its smallest. 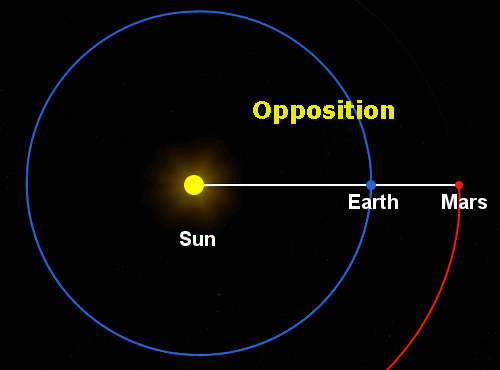 Opposition happens when the planets are on the same side of the sun and a straight line can be drawn through them and the sun. The opposition of early September 1877 helped Asaph Hall discover Mars’ two tiny satellites Phobos and Deimos – he actually discovered them in August. 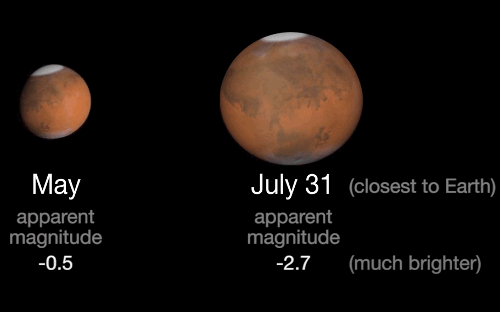 When Mars makes a close approach to our planet, Earth-based observers get a far better view of the red planet. The image above is for the July 2018 close approach of 35.8 million miles, very similar to that of September 1877. 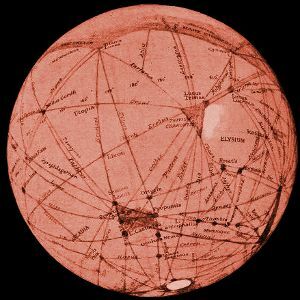 The astronomer Giovanni Schiaparelli took advantage of the 1877 opposition to study Mars’ surface. He noted geographical features he called seas and continents. He also noted canali, Italian for channels: the word was translated incorrectly into English as canals. The map Schiaparelli drew of the Martian surface. Lowell followed Schiaparelli’s discoveries of 1877 with interest. In 1883, in Japan, Lowell was saddened to learn Schiaparelli was going blind. He had hoped Schiaparelli’s research would bring the world more news about canals and life on Mars. In 1892, Lowell heard that the Harvard astronomer William Pickering had begun a study of Mars. In late-1893, Lowell decided he would use his own wealth to build an observatory specifically to study Mars under the best possible viewing conditions. He contacted Pickering. Pickering, who had experience of high altitude observatories, advised Lowell to build his observatory at a high elevation to minimize the distortion of the light caused by Earth’s atmosphere. He said Arizona would be good. Lowell sent the young astronomer Andrew Douglass to Arizona to find a suitable site. After some fieldwork, Douglass recommended Flagstaff, a remote location at an elevation of 7,250 feet (2,210 meters), largely cloud-free, and far removed from interference from city lights and smoke. Lowell moved extraordinarily quickly to build his observatory on the Arizona site, equipping it with twelve-inch and eighteen-inch refractor telescopes. 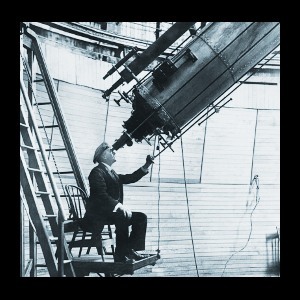 On May 24, 1894, observations of Mars with the eighteen-inch telescope started at Flagstaff. Lowell, age 39, was so impressed by the high quality images of Mars the site provided that he immediately ordered a twenty-four-inch refractor of focal length thirty-one feet to be built. Lowell making observations with the 24-inch refractor. Lowell drew pictures of the markings he saw on Mars, interpreting them as canals. One of Lowell’s drawings of Mars’ surface. Lowell believed he saw enormous straight canals thousands of miles long. He likened the length of the canals to the distances from London to Denver or Boston to the Bering Strait. While the public greeted Lowell’s work with enthusiasm, professional astronomers reacted with skepticism. Lowell claimed the existence of canals proved an intelligent civilization lived on Mars. He said Martians had built their canals because their planet suffered from severe droughts. The science fiction writer H. G. Wells took Lowell’s theme as the basis of his tremendously popular 1898 novel The War of the Worlds in which Earth was invaded by Martians because their own planet was dying. Yet, across the gulf of space… intellects vast and cool and unsympathetic, regarded this Earth with envious eyes, and slowly and surely drew their plans against us… That last stage of exhaustion, which to us is still incredibly remote, has become a present-day problem for the inhabitants of Mars. The immediate pressure of necessity has brightened their intellects, enlarged their powers, and hardened their hearts. Lowell’s theories of Mars collapsed when the planet made another close pass of Earth in 1909. On September 20 of that year, the Greek astronomer Eugène Antoniadi focused a 33-inch telescope on the Red Planet under perfect viewing conditions. Until then, Antoniadi had been a canal enthusiast – he had ‘discovered’ several canals on Mars using a smaller telescope. 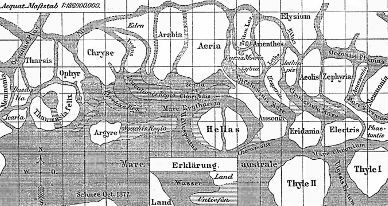 Antoniadi’s drawings of Mars showed no canals. One of Antoniadi’s drawings made using the 33-inch telescope. He saw no canals. The Martian canal saga was over. In 1912-13, Vesto Slipher, who had worked for Lowell since graduating from Indiana University three years earlier, discovered galactic redshifts, hinting at an expanding universe. In 1914, Slipher discovered the rotation of spiral galaxies. Slipher spent his entire career at the Lowell Observatory, becoming director in 1926 and retiring in 1952. In his days as a student at Harvard, Lowell attended Benjamin Pierce’s lectures. Contradicting other astronomers, Pierce claimed Neptune was not discovered on paper by Urbain Le Verrier and John Couch Adams. He said that while Le Verrier and Adams got the position of the planet right, their calculations for its mass, brightness, and orbit were wrong. The discovery of Neptune, he said, was a fluke. Le Verrier and Adams had used slight deviations in Uranus’s orbit from the orbit predicted by Newton’s law of gravity to deduce the existence and location of Neptune. Lowell wondered if another undiscovered planet might be affecting Uranus’s orbit. In 1902, he began lecturing and writing about the possible existence of this undiscovered planet. In 1905, he began searching quietly for a ninth planet without first calculating its likely position. He concentrated the search on the solar system’s plane, but did not find the planet. He then began doing his own calculations in Boston, sending possible planet positions to Flagstaff for the astronomers to photograph. They regularly sent him the photos to study. He scrutinized over 400 photographic plates, but did not find the ninth planet. In 1908, Lowell began calling the ninth planet Planet X. At the end of the year, William Pickering contacted him. Pickering, who had advised Lowell to place his observatory in Arizona, now wanted help. He too was searching for the ninth planet. He had calculated its location, mass, orbit, etc., and wanted Lowell’s help to find it. Lowell refused, but was worried. Was Pickering going to beat him to the prize? Lowell relaxed when he read a paper Pickering authored – Pickering’s calculations were less sophisticated than his own. Lowell renewed his assault on the planet, performing calculations in the style of Le Verrier, aided by his newly hired assistant Elizabeth Williams. He wired positions to the astronomers at Flagstaff, new photographic searches were undertaken, but again they were fruitless. By 1912, Lowell had hired four more assistant mathematicians and his astronomers at Flagstaff were searching feverishly for Planet X using a new 40-inch reflector. In October he collapsed with nervous exhaustion, forcing him to take a complete break for the rest of the year – a hard task for a workaholic like Lowell. In 1915, he wired the results of a final calculation to Flagstaff. Again, the astronomers found nothing at the position he suggested. On July 2, 1916, astronomers at the Lowell Observatory took the final photograph in their search for Planet X. 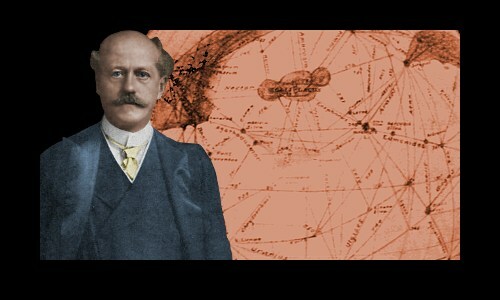 Four months later, Percival Lowell was dead. In a decade of searching for Planet X, a new planet had not been found. However, it had been photographed. Twice! 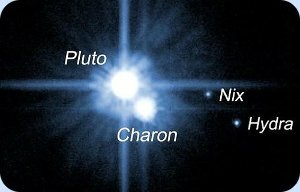 In 1930, when the Lowell Observatory announced that its young astronomer Clyde Tombaugh had discovered a new planet, Pluto, it emerged that of the 1,000 photographic plates taken in Lowell’s renewed assault on Planet X, two had contained Pluto. Nobody had noticed it at first because it was 1,000 times fainter than Lowell’s prediction for Planet X’s brightness. Pluto – Not Planet X, Not even a Planet! Lowell’s final calculations indicated Planet X’s mass was 6.6 times greater than Earth’s. Pluto’s mass is actually just 0.002 times Earth’s – not enough to have any effect on Lowell’s gravity calculations. Pluto could not have been Lowell’s Planet X.
Pluto is now classed as a dwarf planet, one of a number orbiting the sun beyond Neptune. In 2005, a team from the Palomar Observatory discovered the dwarf planet Eris, 27% more massive than Pluto and orbiting the sun at an average distance about three times greater than Pluto’s. 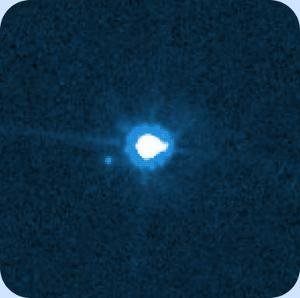 Hubble space telescope image of Eris and its satellite Dysnomia. In 1908, age 53, Lowell married Constance Savage Keith, a feisty 44-year-old Bostonian real-estate speculator. They had no children. Lowell had an 18-room mansion built close to the observatory at Flagstaff. He grew a variety of flowers and pumpkins there in the short periods of recreation time he allowed himself. His gardens and the observatory grounds became an informal wildlife haven. Apparently in good health, Percival Lowell died suddenly at age 61 of a stroke – a cerebral hemorrhage – on November 12, 1916 at his Flagstaff home. He was buried on Mars Hill, Flagstaff, close to the observatory’s dome. Lowell bequeathed a large legacy to support the observatory, but his widow contested it. By the time litigation ended in 1925, the Lowell estate had halved in value – the lawyers got rich. In 1927, the Lowell Observatory returned to searching for the ninth planet, helped by further funding from Percival’s brother Lawrence. It was this search that resulted in Pluto’s discovery in 1930. "Percival Lowell." Famous Scientists. famousscientists.org. 31 May 2018. Web.